TSDuck is an extensible toolkit for MPEG/DVB transport streams. TSDuck is used in digital television systems for test, monitoring, integration, debug, lab, demo. Transport stream acquisition or transmodulation, including DVB, ATSC, ASI and IP multicast. Analyze transport streams, PSI/SI signalization, bitrates, timestamps. Monitor and report conditions on the stream (video and audio properties, bitrates, crypto-periods, signalization). On-the-fly transformation or injection of content and signalization. Modify, remove, rename, extract services. Work on live transport streams, DVB-S/C/T, ATSC, ASI, IP-TV, HTTP, HLS or offline transport stream files. Cheap DVB or ATSC tuners (USB, PCI). Professional Dektec devices, ASI, modulators (USB, PCI). Re-route transport streams to other applications. Extract or inject Multi-Protocol Encapsulation (MPE) between TS and UDP/IP. Analyze and inject SCTE 35 splice information. Extract specific encapsulated data (Teletext, T2-MI). Emulate a CAS head-end using DVB SimulCrypt interfaces to and from ECMG or EMMG. TSDuck is developed in C++ in a modular architecture. It is easy to extend it through plugins. In fact, the primary requirement for TSDuck architecture was to be able to implement any new feature within a couple of hours, which happened to be the case most of the time. To be easily extended, TSDuck needed to be simple. TSDuck is a collection of command line tools and plugins. There is no sophisticated GUI. Each utility or plugin performs only one elementary feature but they can be combined in any order. In short, TSDuck shall be understood as a General-Purpose Toolbox for Digital TV Engineers and not as a specialized application for production operators. And, by the way, TSDuck is Free and Open Source. 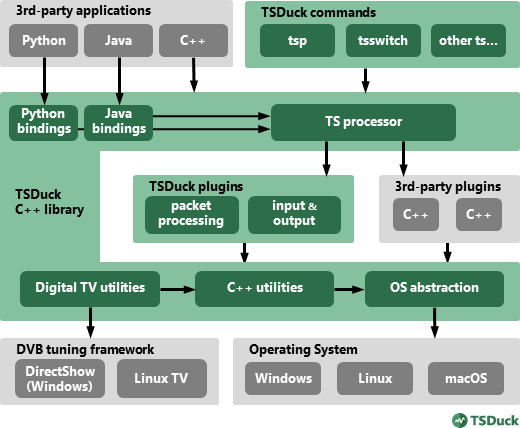 The most important TSDuck tool is tsp, the transport stream processor. It is a flexible transport stream processing framework. Running tsp is a combination of elementary processing operations using plugins. One input plugin which receives a TS from various possible sources. Any number of packet processing plugins which can perform any transformation on the packets in transit. One output plugin which sends the TS to various possible destinations. The currently existing input and output plugins can work on TS files, UDP/IP (multicast or unicast), DVB sources using cheap tuners, professional Dektec modulators and ASI devices, HiDes modulators. This example describes a test bed or demo infrastructure for MPE injection and MPE extraction. The network infrastructure is illustrated in the diagram below. In network 1, a media server multicasts a transport stream on address 224.250.250.1, port 9000. We want to encapsulate this UDP multicast stream in an existing transport stream using MPE. This existing TS is a live satellite feed which is received using a DVB tuner. We also change the multicast destination address for the UDP stream to 230.2.3.4, port 7000, in the MPE-encapsulated datagrams. There is no particular reason for this, we just illustrate the feasibility. The resulting transport stream with embedded MPE is then broadcast. Here, the broadcast network is a Dektec modulator, followed by another computer using a DVB tuner. This computer is connected to a second network. Another instance of tsp extracts the datagrams from the MPE stream and multicasts them on its network using the modified destination address. The first tsp command adds two services in the existing transport stream. One service carries the IP/MAC Notification Table (INT). The other one carries the MPE stream. We create a fully DVB-conformant signalization for these two services. The second tsp command extracts the MPE stream from the received TS and forwards all decapsulated UDP multicast datagrams on the local network. This example is fully described in the TSDuck User's Guide with all details and corresponding commands. Specific plugins such as merge and fork respectively combine and duplicate transport streams. They are designed to route transport streams from and to other applications. When the "other" application is another instance of tsp, we can create complex processing graphs. In addition to tsp, the command tsswitch can be used to switch inputs between a set of transport streams using the same input and output plugins as tsp. Switching between inputs can be performed automatically at the end of each input or through a remote control application. The remote control protocol is extremely simple, based on text messages in UDP datagrams. The remote control can be performed using simple command lines. The bash shell provides an easy way to redirect output to an UDP message. The following sample commands send UDP messages on port 4444 to system 127.0.0.1 (the local host). This is the easiest way to use the tsswitch remote control. The following diagram illustrates a real-life example. To test a Conditional Access System and signalization, tsp is used to create a new transport stream from a live source. One real TS is received as input using a cheap USB or PCI DVB-T tuner. This TS and all its services are renamed, creating a "new TS" in the network. 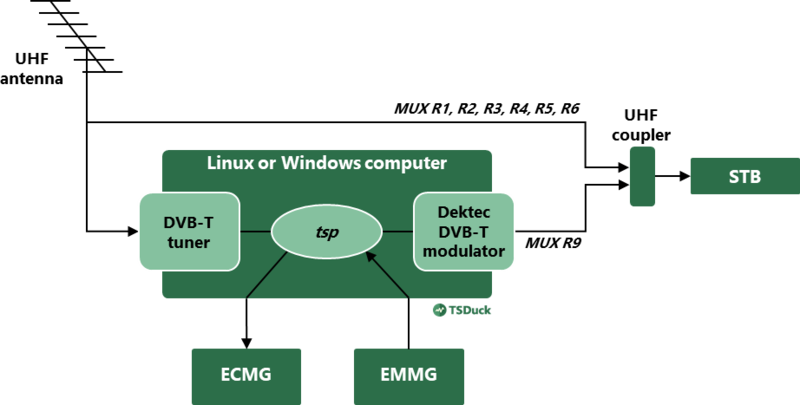 To test the CAS, tsp interacts with a real ECMG and a real EMMG using the standard DVB SimulCrypt protocols. One service, initially in the clear, is scrambled. tsp generates the control words, scrambles the content and inserts ECM's and EMM's. Finally, a set-top box receives all live transponders plus the new one we create. Everything is done in one single tsp process. The command is the following. For clarity, the details such as tuning parameters, access criteria, IP addresses and ports, are represented as environment variables. This command is complex but rational. The option -I on the first line specifies the input plugin and its arguments. Here, the input plugin is dvb which drives DVB tuners. Each option -P specifies a packet processor plugin and its options. The plugins tsrename and svrename respectively rename the transport stream and a service. The plugin scrambler is a DVB scrambler on one service. It generates control words, interacts with a standard ECMG and insert ECM's. It also updates the PMT of the service to declare the ECM PID. The plugin cat modifies or creates the CAT to declare a new EMM stream. The plugin datainject implements a DVB SimulCrypt EMM/PDG inserter. It is used as a server by a standard EMMG to insert EMM's, just as if it was a MUX. Finally, the option -O on the last line specifies the output plugin and its arguments. Here, the output plugin is dektec which drives a Dektec modulator, a PCIe board in the computer. For more details, refer to the TSDuck User's Guide. Of course, such a complex command should be maintained and edited in a shell script. Unless of course we enjoy retyping it every time. Because of its modular structure, TSDuck is better used with a flexible shell. On Windows systems, we may use PowerShell, Cygwin or MSys (DOS command line windows should now be reserved to polymorphic deviants only). TSDuck provides many ways to manipulate PSI/SI and other types of MPEG tables. Tables can be extracted, examined, injected or modified on the fly using specific plugins for tsp. Transport stream files: Sections and tables are extracted ("depacketized") from or inserted ("packetized") into TS packets in transport streams. Section files: These binary files contain sections. Each section is stored in raw binary format. Sections are simply concatenated without any encapsulation. XML files: TSDuck defines a specific XML syntax to represent most standard PS/SI tables and descriptors. XML being a text format, such tables can be edited or created by hand using any text editor. TSDuck utilities manipulate tables in any of these formats and converts between them. Specifically, the command tstabcomp is a table compiler. It takes XML source files as input, compiles the tables they contain and output binary section files. Thus, we can create any arbitrary table from scratch and build the corresponding binary sections to inject them in a transport stream. The command tstabcomp is also a table decompiler which can recreate the XML representation of tables from their binary sections. More generally, all TSDuck commands can manipulate tables in binary or XML format equally. Tables can be captured from a live transport stream and directly saved in XML format. We can then edit the XML files to modify the tables and reinject them in any other transport stream. Let's look at the various steps in a real example. We need to reproduce the case of a broadcast stream (satellite, terrestrial, whatever) with a specially crafted NIT. The plugin nit in tsp provides a convenient way to modify a NIT on the fly. But let's assume that the modifications we need are so specific that this plugin cannot do what we want. TSDuck can also be used as an MPEG/DVB C++ library for your own applications. Most of the TSDuck code is located into a large shareable library. The utilities and plugins are usually only small wrappers around the TSDuck library. You may use the TSDuck library to develop new plugins or create completely independent applications. The following diagram illustrates the TSDuck software architecture. All C++ classes in the TSDuck library are documented using Doxygen. There is a binary installer for the TSDuck development environment too. So, there is no need to rebuild TSDuck first. See more details here. Here is a summary of all command line utilities and tsp plugins which are installed with TSDuck version 3.18-1208. TSDuck is open source and released under the BSD license. It is developed in C++ and designed to be portable. TSDuck is built and tested for Windows, Linux and macOS. Please see the list of useful links in the side menu. Pre-built binary packages are available for Windows, Fedora, Ubuntu, CentOS/RedHat (Intel) and Raspbian (Raspberry Pi). See the Download section in the side menu. On macOS, TSDuck is installed using the Hombrew packager. See the guidelines to install TSDuck using Homebrew. Rebuilding TSDuck, with or without its binary installers and packages, is documented here. Support for specialized hardware, DVB tuners, Dektec devices, HiDes modulators, is available on Windows and Linux only. Please report problems or ask questions using the issue tracker. TSDuck is referenced in the list of Open Source Software for Broadcasters by the EBU (European Broadcasting Union). TSDuck was presented at the EBU Open Source Meetup during the IBC 2018. An technical note from Cisco named "Configure DVB-C Lab Environment with cBR-8, TSDuck, and VLC" describes how to configure a Digital Video Broadcasting - Cable (DVB-C) lab scenario with the TSDuck toolkit, VLC, and cBR-8 (a Cisco equipment). TSDuck is released under the terms of the license which is commonly referred to as 2-Clause BSD License or Simplified BSD License or FreeBSD License.